SATURDAY NOR'EASTER UPDATE: While the exact track of Saturday's storm is still in doubt, I would start planning on dealing with snow here in the Hudson Valley on Saturday. It looks like the snow will arrive early in the morning on Saturday, and last into Saturday evening. While some mixing is possible South of I-287, I think this is going to be mainly snow here in the Hudson Valley. Right now, this does not look like a crippling blizzard for the Hudson Valley. However, moderate snowfall accumulations are possible, which means a good plowable snow. 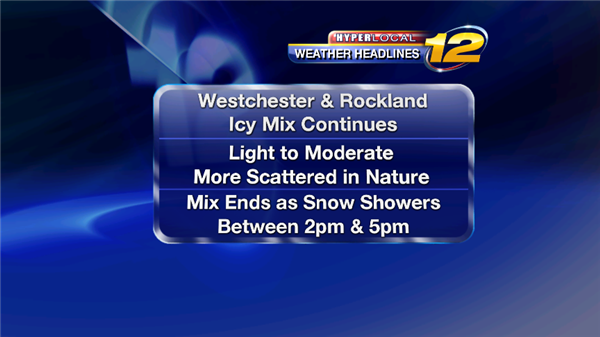 Stay close to News12 and News12.com for the very latest. SATURDAY NOR'EASTER UPDATE: OK, here are the details as I see it this morning. Snow will develop here in the Hudson Valley between midnight and 2am tonight. Snow will then continue overnight here in the Hudson Valley. Between 7AM and 10AM Saturday morning, the snow will change to a mix of sleet and freezing rain, and then quite possibly to plain rain in many of our communities. Only Western Orange County may stay all snow. The rain/mix will end between 2pm and 5pm on Saturday. Before the changevoer, 2" to 5" of snow is possible here in the Hudson Valley, with a 1/2" of rain possible on top of the snow. So it will be a real mess, especially Saturday morning. Stay close to News12 and News12.com for LIVE updates. NOR'EASTER UPDATE: Our Saturday storm continues to pull away from the Hudson Valley as of early this afternoon. The precipitation has lightened up substantially. As we head through the rest of today, only light and scattered rain, wintry mix or snow will fall here in the Hudson Valley. Conditions should dry out for good by 5pm this afternoon. Additional snow accumulations up to 1" possible with any lingering snow shower activity. However, road conditions should continue to improve as we head through the afternoon. However, temps will fall below freezing tonight, which means look out for black ice! Stay close to News12 and News12.com for updates. EARLY WEEK STORM UPDATE: A powerful nor'easter will affect the Hudson Valley Monday night into Tuesday. Light snow or flurries will develop Monday morning here in the Hudson Valley. I am not seeing a lot of snow on Monday; maybe 1-2" throughout the entire day. However, the snow will become heavier Monday night into Tuesday. This looks like an all snow event for the Hudson Valley. The snow will end Tuesday evening. At this point 8-16" of snow is possible here in the Hudson Valley, with the highest amounts EAST of the Hudson Valley. Now if the storm forms and moves a bit farther east, we could see less snow. But for now, start preparing for the big one, later Monday into Tuesday. STORM UPDATE: The latest model runs still support a major snowstorm for the Hudson Valley. The rest of this afternoon will feature occasional light snow here in the Hudson Valley. By 5pm, accumulations will range from a coating to 2". The snow will turn heavier tonight and the wind will increase as well. The worst of the weather will be with us from 10pm tonight until 12pm Tuesday afternoon. WHITE OUT CONDITIONS ARE LIKELY during this time period. The snow will lighten up Tuesday afternoon and end Tuesday evening. Accumulations will range from 12"-24" in Westchester, Putnam and Southern Dutchess Counites, to 8-16" for Rockland and Orange Counties. If possible, try to avoid travel between 5pm this evening and 5pm Tuesday evening. 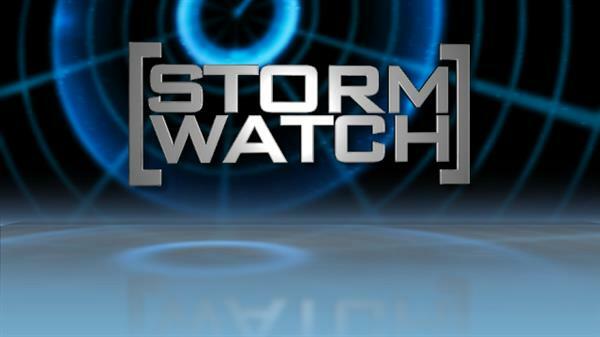 Stay close to News12 and News12.com for LIVE updates throughout the storm. STORM UPDATE: This storm has been a total bust for us here in the Hudson Valley. The storm has formed farther east, and so the blizzard conditions remained well east of the Hudson Valley. Snowfall so far has been between 2-6", with only an additional 1-3" possible for the rest of today. The snow will taper off and end by mid-afternoon. Stay close to News12 and News12.com for LIVE updates. SUNDAY NIGHT INTO MONDAY STORM UPDATE: It looks like the Hudson Valley will have to deal with a quick shot of snow Sunday night into Monday. As of early Friday afternoon, these are my preliminary thoughts; Snow will overspread the Hudson Valley between 6pm and 10pm Sunday evening. Snow will then fall heavy overnight, tapering off around noon on Monday. I am not ready to throw out totals yet, but start planning for a moderate to heavy snowfall here in the Hudson Valley (maybe similar to what we received last Friday night/Saturday morning). Again, these are my preliminary thoughts, and are subject to change. 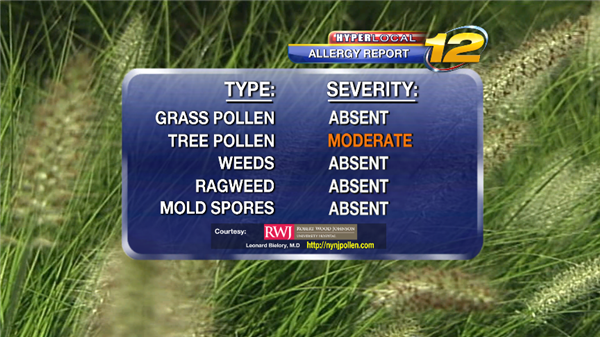 So stay close to News12.com over the weekend. I will send another update around lunchtime on Saturday. Here is how much additional snow and ice is possible this afternoon here in the Hudson Valley. 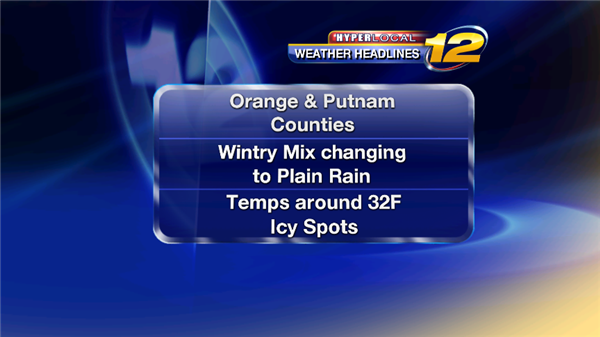 Here is your updated afternoon forecast for Orange and Putnam Counties. Scroll down to see how much additional snow and ice is possible in your community this afternoon. 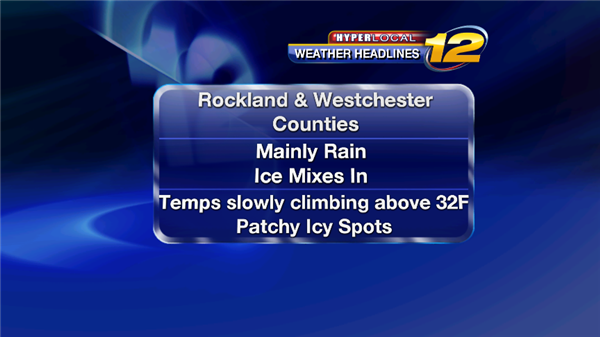 Here is your updated afternoon forecast for Westchester and Rockland Counties. Icy mix will end as snow showers. Scroll down to see how much additional snow and ice is possible in your community this afternoon. Here is how much snow is possible Thursday morning with any moderate to heavy snow showers. 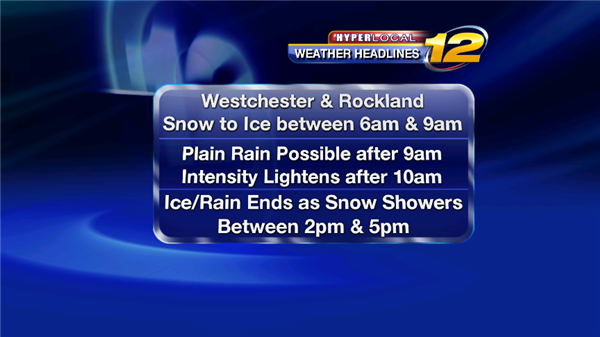 Here is what you can expect Thursday morning here in the Hudson Valley. Please take it easy on the roads if you encounter any moderate to heavy snow bursts. 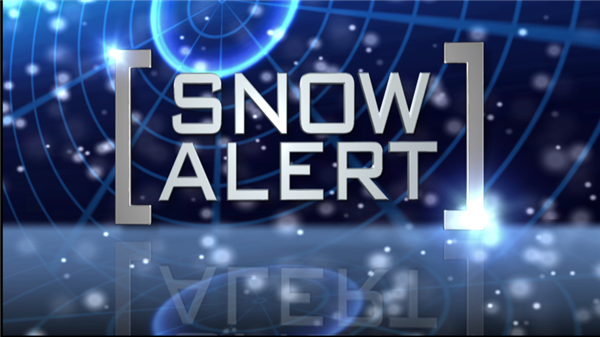 HV SNOW ALERT: Snow showers are possible during the Thursday morning commute. Scroll below to see what you can expect on Thursday here in the Hudson Valley. Here is how much additional snowfall/sleet is expected here in the Hudson Valley until midnight. This does not include what may have fallen in your hometown before 9AM. 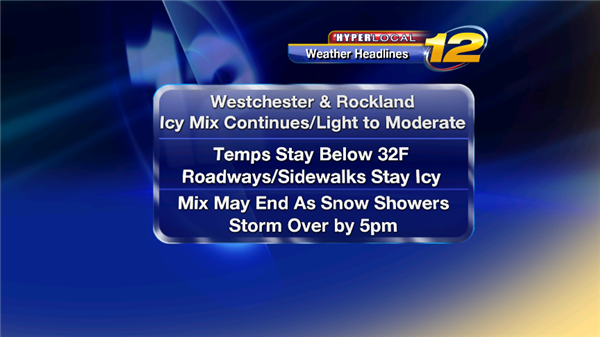 Here is what you can expect throughout the entire Hudson Valley into tonight. Scroll down for how much additional snowfall can be expected. Scroll down for what you can expect here in the Hudson Valley into tonight. HV SNOW UPDATE: As of now, it looks like snow will develop here in the Hudson Valley on Saturday afternoon between 12pm and 3pm. The snow will then continue into Saturday night; the snow will fall light to occasionally moderate into Sunday morning. The snow threat will end by 9am Sunday morning. This will be an all snow event here in the Hudson Valley, with no ice expected. Total snow accumulations look to be 1” to 3” in Orange and Rockland Counties, with 2" to 4” in Westchester, Putnam and Southern Dutchess Counties. 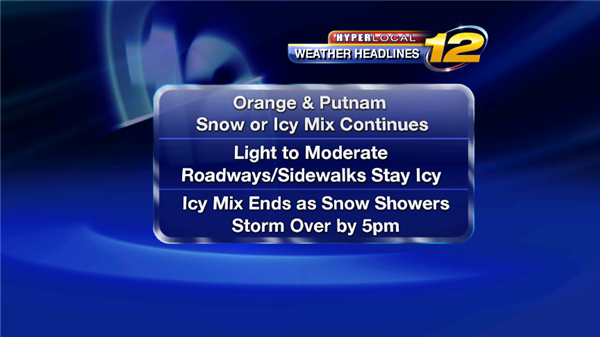 Stay close to News12 and News12.com for LIVE updates. I will send updates as conditions warrant. 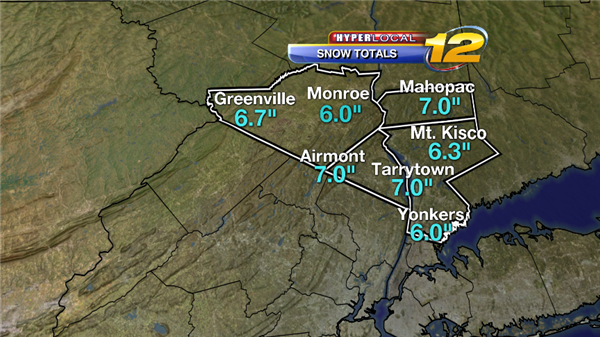 SNOW UPDATE: The models are trending colder which means more snow and less ice and rain here in the Hudson Valley. But that may actually make cleanup Sunday morning a bit easier. Here are the details. Snow will overspread the Hudson Valley between 1pm & 4pm this afternoon. Snow will then continue in all of our communities through this evening. Around 10pm tonight, the snow will begin to change to sleet and then maybe to plain rain South of I-287, if temps get above 32F. 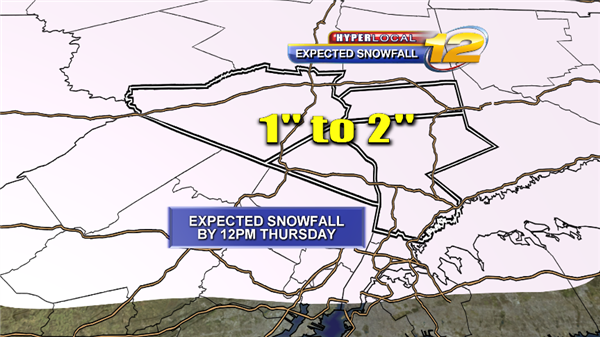 I think most spots North of I-287 will stay either sleet or snow. I am NOT expecting much in the way of freezing rain with this system, which is good news. Regardless, whatever is falling in your hometown overnight will taper off after 1am. By daybreak Sunday, all the activity should be gone, with Sunday looking dry here in the Hudson Valley. 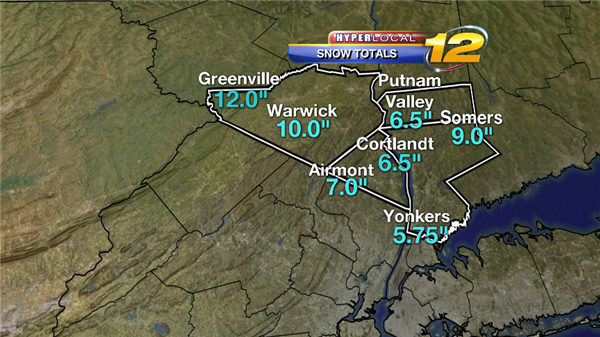 Total snow accumulations look to be a general 3” to 6” here in the Hudson Valley. If your community sees mixing, you will be on the lower end of the snowfall range. If your community stays mainly snow, you will be on the higher end of the snowfall range. 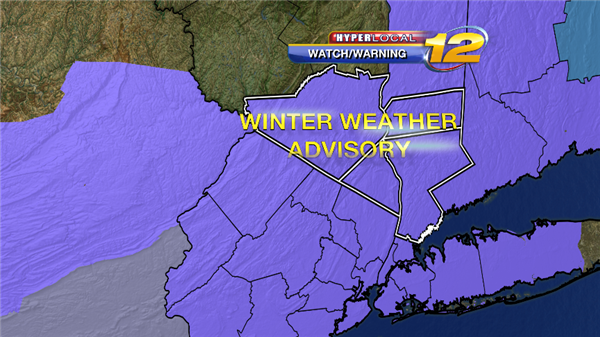 Stay close to News12 and News12.com for LIVE updates into tonight. HV SNOW ALERT FOR SUNDAY: Here are my initial thoughts about Sunday. Snow will develop here in the Hudson Valley after 3pm on Sunday. Snow will then continue Sunday night, ending by 4am Monday morning. This storm is now looking like all snow here in the Hudson Valley, which again, is actually good news. 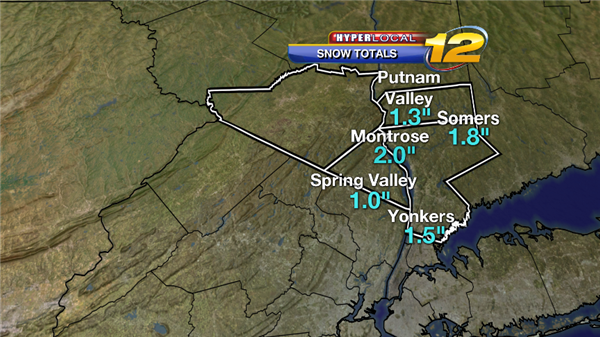 Total snow accumulations look to be 1" to 3" here in the Hudson Valley. 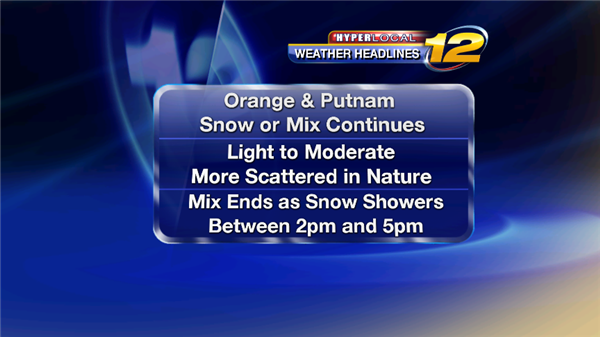 Stay close to News12 and News12.com for LIVE updates into this weekend. I will send another update on Saturday. HV SNOW UPDATE: It now looks as if the snow will start a bit earlier on Sunday here in the Hudson Valley. Light snow or flurries will break out anytime after 9am Sunday morning. The snow should stay mainly light into the afternoon with around 1” of snow possible by 4pm Sunday. After that, the snow will fall steadier and heavier as we head into Sunday evening. The snow should end very early Monday morning between 1am and 4am. While some mixing is possible towards the tail end of the event, especially south of I-287, this is looking like predominately snow once again here in the Hudson Valley. Total snow accumulations look to be in the 2” to 5” range. Since conditions should be dry after 4am Monday, I would expect the main roads to be decent for travel by 9am Monday morning. Stay close to News12 and News12.com for LIVE updates. I will send another update Sunday morning. HV STORM UPDATE: An arctic front will move through the Hudson Valley tonight. This will cause temperatures to drop back into the 20s. As a result, any light rain this evening will transition to light snow after 10pm. As the front slips south, a wave of low pressure will ride up the front continuing our snow chance into Thursday. As of now, 2-5” of snow is possible South of I-287, with a coating to 2” of snow possible North of I-287 later tonight into Thursday afternoon. However, the exact amount of snow will be determined by the exact position of the arctic front. If the front slides farther south tonight, we will see less snow. If the front hangs-up here in the Hudson Valley, we will see more snow. I will say that the forecast is rather uncertain for later tonight and Thursday, so stay close to News12 and News12.com for LIVE updates. MARCH MADNESS! The arctic front is now going to hang-up close to the Hudson Valley. This now means that periods of snow will continue until mid to late afternoon today here in the Hudson Valley! Moderate to heavy bursts of snow are possible this morning, so if you are heading out, please take it easy on the roads. Temperatures will be dropping into the 20s, which means any standing water or slush will freeze this afternoon. As you can see above, most of us are now in the 2" to 5" snowfall range; only NW Orange, Northern Putnam, and Southern Dutchess Counties are the the Coating to 2" range. It is going to be an active and changeable weather day. So please stay close to News12 and News12.com for LIVE updates. SPRING SNOW ALERT! Please don’t hit me, but the chance for snow is now on the table for the 1st day of spring this Friday. A coastal storm is expected to form Friday morning to our south, and then move up the east coast Friday afternoon. Temperatures high in the atmosphere will be cold enough for snow. The question is, will surface temperatures be cold enough for snow? And right now, the answer is it is possible. The rain or snow will start mid-morning on Friday and end Friday evening. The good news is snow later in March usually has a hard time sticking on treated roadways during the daylight hours. This is because the sun is strong in March, and its energy makes it through the clouds and warms black-top surfaces. So travel may end up being OK on Friday, if we do indeed see snow. Of course its too early to talk about accumulations, and if the surface temp warms just a bit, we could still see mainly rain. So stay tuned…..
HV SNOW ALERT FOR FRIDAY: Friday is the 1st day of spring here in the Hudson Valley. It’s obvious that Mother Nature could care less! Snow will develop here in the Hudson Valley between 10am and 1pm on Friday. Periods of snow, heavy at times, will then continue into Friday evening. The snow will end between 7pm and 10pm Friday evening. While some mixing is possible, this is looking like a mainly snow event for us here in the Hudson Valley, as temperatures hover just below 32F. Now, main roadways may be just wet until 4pm on Friday. HOWEVER, if we receive moderate to heavy bursts of snow early in the afternoon on Friday, all roadways may end up getting covered. As you can see from the above map, most of the Hudson Valley can expect 2” to 4” of new snow on Friday. Locations along and North of I-84 will see 1” to 3” of new snow. 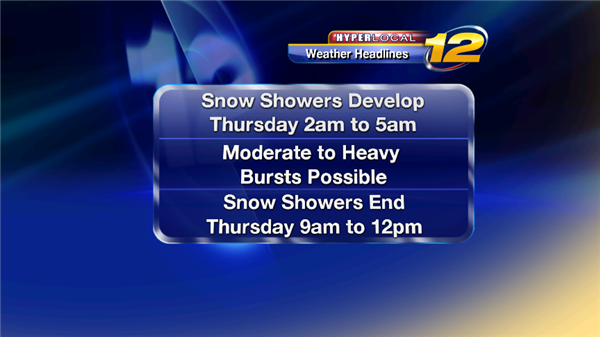 Things could change (and probably will) so stay close to News12 and News12.com for LIVE updates. I will send another update this evening. HV SNOW UPDATE: Snow is on track to develop Friday between 10am and 1pm here in the Hudson Valley. Snow will then continue into the evening on Friday. This continues to look like a mainly snow event here in the Hudson Valley, with temperatures ranging from 29F to 32F during the snowfall. 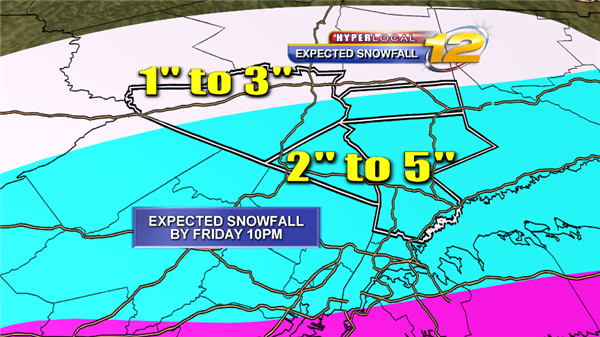 The snow will taper off and end between 7pm and 10pm Friday night. If the snow stays on the lighter side, main roads could stay just wet through 4pm Friday, as the strong March sun acts to slightly warm black-topped surfaces. HOWEVER, if the snow turns moderate to heavy, all roadways will begin to get snow covered. So prepare for the worst, and hope for the best. Accumulations for most of us will be in the 2” to 5” range, with the best chance for seeing 5” South of I-287 in Westchester County. For those living near and north of I-84, you can expect 1” to 3” of snow. 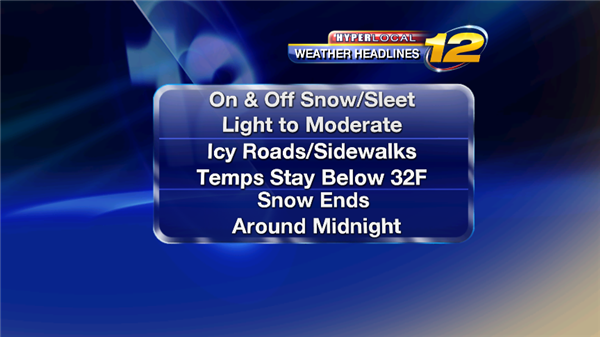 Stay close to News12 for LIVE updates tonight. And tune in tomorrow morning starting at 5am. I will provide LIVE updates all morning long. HV SNOW UPDATE: Snow will continue this afternoon here in the Hudson Valley, with moderate to heavy bursts likely come mid to late afternoon. This will be a mostly snow event for us, with temps between 29F and 32F during the snow fall. The snow will taper off and end between 7pm and 10pm this evening. If the snow stays light, mains roads may just be wet until 4pm. HOWEVER, if the snow turns heavy, all roads will begin to get snow covered. You can expect up to 2” of snow by 5pm this evening. As you can see from the above map, most of us can expect a total of 2” to 5” of snow, with the best chance of seeing 5” South of I-287 in Westchester County. 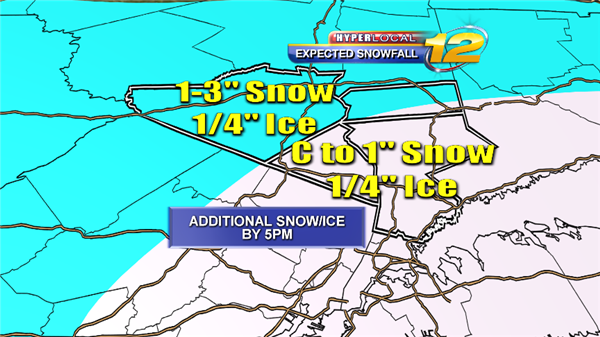 Those living near and north of I-84 can expect 1” to 3” of snow. 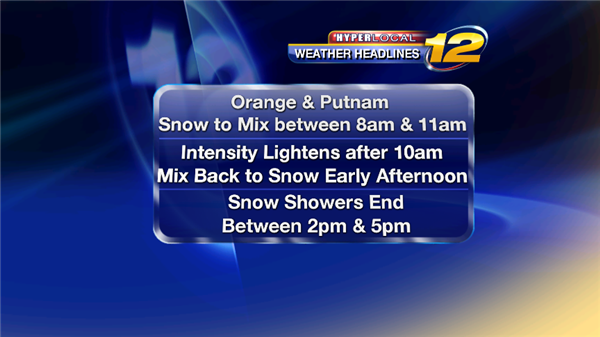 Stay close to News12 and News12.com all day for LIVE updates into this evening. 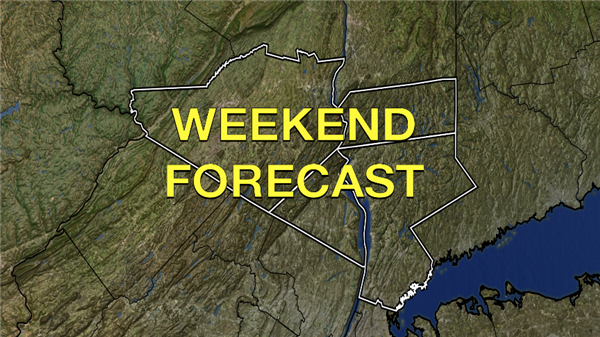 HV WEEKEND FORECAST: Saturday will be partly sunny and cold here in the Hudson Valley. While scattered flurries or a snow shower are possible, there will be no accumulation of snow on any roadways here in the Hudson Valley. So please do not cancel or change plans for Saturday, even though there will be some flakes around. The big story is that temps will run 10+ degrees below normal, with highs only in the upper 30s. Sunday will be mostly sunny and chilly, with high temperatures creeping back into the lower and middle 40s. SPRING SNOW ALERT: More spring snow is possible here in the Hudson Valley during Tuesday afternoon. Light snow or a rain/snow mix will develop early Tuesday afternoon here in the Hudson Valley. 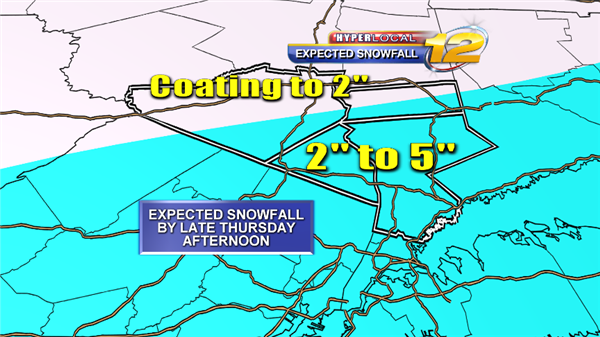 The snow or snow/rain mix may change to plain rain, especially south of I-287 Tuesday afternoon. Temperatures will be above freezing Tuesday, so once again, any snow that does fall will not stick to the roads. However, some minor accumulations (Coating to 2") of snow on grassy/colder surfaces is possible. The activity should stay rather light, so I am not expecting major problems on the roads here in the Hudson Valley. So my advice is to not change or cancel plans for later Tuesday afternoon/evening. 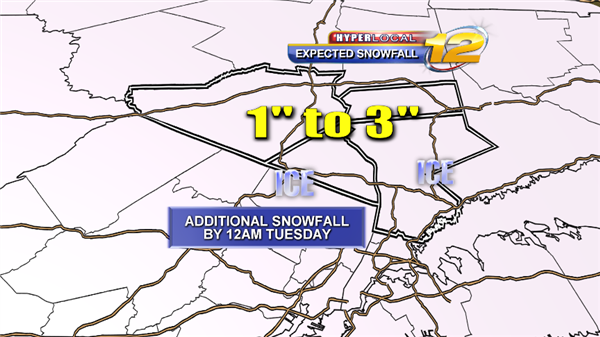 The snow or rain/snow mix with end around 8pm Tuesday evening. Stay close to News12 and News12.com for LIVE updates. 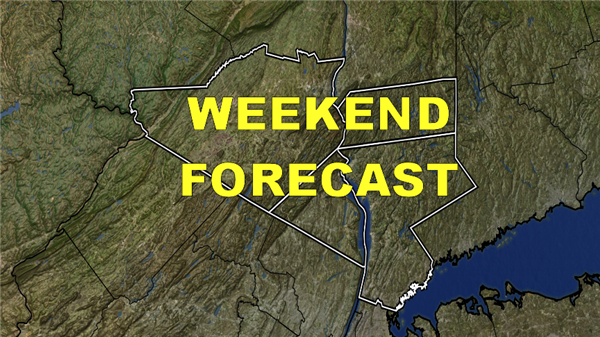 HV HOLIDAY WEEKEND WEATHER: Steady rain from Friday night will end by 7am Saturday morning. The rest of Saturday will feature increasing sunshine. However, it will be very windy and much cooler on Saturday, with high temperatures dropping back into the 40s. Easter Sunday will start off sunny and cold. By the afternoon, some extra clouds will arrive, with a few rain showers now possible after 4pm. It will be a bit warmer Sunday, with afternoon highs returning the 50s here in the Hudson Valley. Updated pollen counts for the HV. As is usually the case this time of year, its the tree pollen that affects us. The rain this week should lower the counts a tad.